Could Nazism Get A Following In The UK? The events in Charlottesville, Virginia have shocked not just the US but the world. For many, particularly those who do not use social media, it was a rude awakening to the rise of White Supremacy and to a growing subculture who identify with Fascist and Neo Nazi beliefs. The conditions that have allowed fascism to flourish in America are complex. America has always had a strong sense of identity as a country and, while this can be positive, it can also cross the line from Patriotism to Nationalism. Unlike Patriotism which is love for a country, Nationalism is the belief that a person’s own country and race is superior to others. This leads to bitter divisions and discrimination. The 2008 crash following the housing market bubble in America led to economic problems, creating the conditions from which unrest and civil tension would grow. This discontent was channelled and directed by those with a hate agenda toward minority groups. Free speech is a contentious issue in America and, due to the first amendment of their constitution, there is a reluctance to censor the hate sites and forums on the internet. 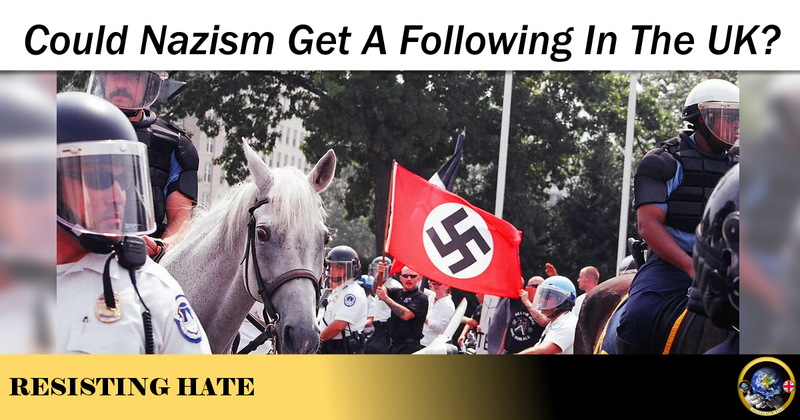 Much publicity has been given to the take down of hate sites Daily Stormer and Stormfront but there are still many examples of haters and hate sites spewing their venom into impressionable ears. Twitter is still failing to delete accounts which openly call for genocide – and social media ‘free speech’ platform GAB as highlighted in our article here is more than happy to allow personal abuse and hate speech. Trump, of course, has played the part of a major catalyst in the upsurge of White Supremacy and Fascism. In hiring Steven Bannon he legitimised Breitbart and the far right press. He filled his rallies with White Supremacists and gave the far right a perceived credibility which they exploited to promote their message as widely as possible. When we look at the UK we can clearly see that the conditions leading to Nazi riots in the US are not very different to the winds brewing on our own side of the Atlantic. The financial crisis hit the UK badly and led to self-imposed austerity which saw unemployment rise, wages freeze and poverty increase. This led to anger and frustration across huge sections of the British public. Brexit took on the same role of catalyst in the UK that Trump played in the States. The referendum gave a voice to xenophobia (to be clear not everybody who voted leave in the referendum was xenophobic but many were) and this opened the gateway to increased acts of violence, of racism and of hate. Hate attacks rose sharply in the wake of the Brexit referendum, an indication of the growing unrest in the UK’s turbulent economic climate. The Holocaust is barely now within living memory. As those who lived through the atrocities of Nazi Germany pass away, we are left with only the history books to educate us on the evils of the Nazi regime. We have long said “lest we forget” but as our survivors slowly disappear it looks very much like we are witnessing the emergence of a generation who has forgotten the evils human beings can do to one another under the influence of Fascism. The warning signs are there for us to see and have been for some time. Hate group National Action was proscribed by the British government but have continued to meet and grow and are slowly building a Neo Nazi base of disenfranchised youths in the North of England. 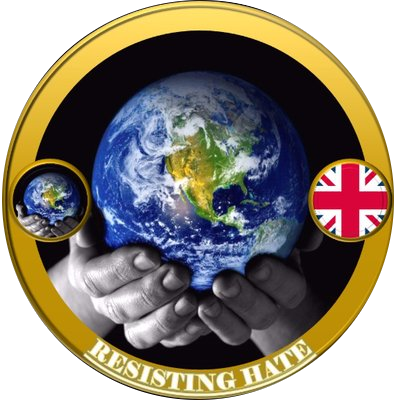 Only this week we have seen four members of the British Army arrested for alleged connections with this Neo Nazi hate group. We are seeing a rise in Holocaust Denial. This week saw the incarceration of known Holocaust Denier Ursula Haverbeck which has spawned a huge backlash of anti Jewish, pro Nazi posts on social media, including this one sent to myself which appeared to express no knowledge or understanding whatsoever of the Holocaust. Vile Anti-Semitics freely spout their hatred of Jews and their ignorance of the Holocaust on Facebook, on Twitter and on every other social media platform. If this continues to go uncensored we risk the real history of this atrocity in our past being forgotten forever. Our group Resisting Hate have reported (and had suspended) one particular account on Twitter titled “DieJewDie” over 25 times. It still keeps coming back. For every anti-Semitic hater we manage to get suspended, ten more bigots spring up. Social media is simply not tackling this problem. The UK also has its own home grown Nazi site Redwatch. As with America, UK Internet Service Providers are doing little to restrict extremist material from being shared and distributed. This diet of hate indoctrination provides a hot bed of recruitment for wannabe Neo Nazis. In addition to the anti-Semitic views associated with Neo Nazis we have also seen a rise in hatred toward our country’s Muslims. Modern Neo Nazis have the same hatred toward Muslims that they do Jews, people of colour and anybody else who does not meet their classification of a “white person.” It beggars belief that in 2017 an openly Islamophobic candidate can stand for political office but Anne Marie Waters who has publicly stated “Islam is Evil” has been allowed to do so. Katie Hopkins has been allowed to call migrants “cockroaches” in the national press. 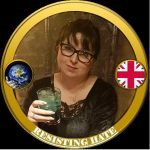 Britain First host a Facebook page with over a million followers which regularly attracts comments calling for the genocide of those who follow Islam. They claim to be a Christian group but have been denounced by every major Christian organisation in the UK. Tommy Robinson organised the (rather ironically named) “March against Hate” in Manchester which led to drunken yobbos publicly taking bites from the decapitated head of a pig, The London Forum (a favoured speaking venue for the far right) has welcomed infamous Anti Semite David Irving as a guest speaker and an MP was stabbed by a radicalised far right extremist. The question is not whether Nazism can get a following in the UK but, now that it has, how do we stop it?